It seems like there’s a new project every week on the main Boise campus of St. Luke’s Health System. Now the non-profit hospital system is set to revamp its surgery center across 1st Street from the historic original hospital building. patient pre/postbeds and patient check-in/ waiting areas,” according to a letter from project architect Brian Coleman requesting design review approval of the changes. On the outside, a few changes will be noticeable – including moving an entryway, extending the mechanical screen on top the building and a few other minor tweaks – including seismic safety upgrades. 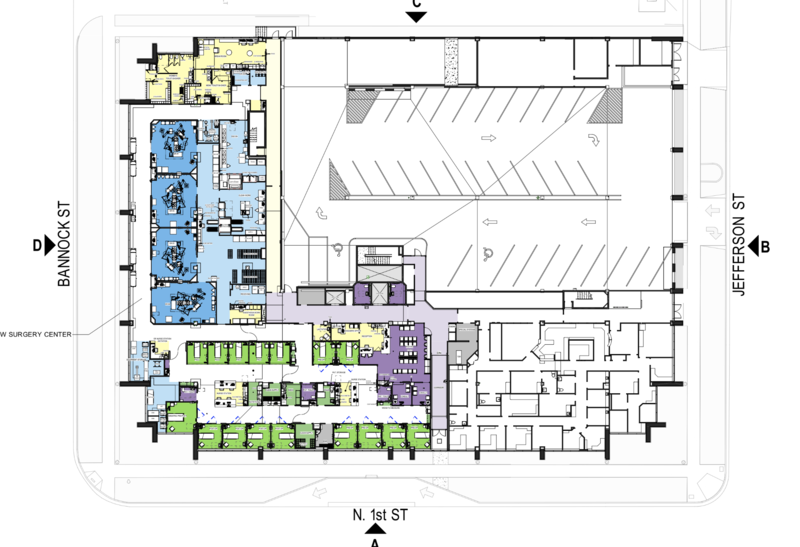 Floorplans show the internal configuration of the ambulatory surgery center would be completely reworked, with four smaller operating rooms replaced with four much larger suites. Pre and post operation rooms would also be reconfigured in a more streamlined design.